Screen shot of the interactive Harvest Plan Map (above) and extracts from the Update List received by e-mail (below). In an unannounced but welcome improvement, the update lists that provide summary stats on the latest NSDNR harvest plan announcements now include a category titled “Prescription Type”. These lists are received by e-mail after you sign up for notifications. 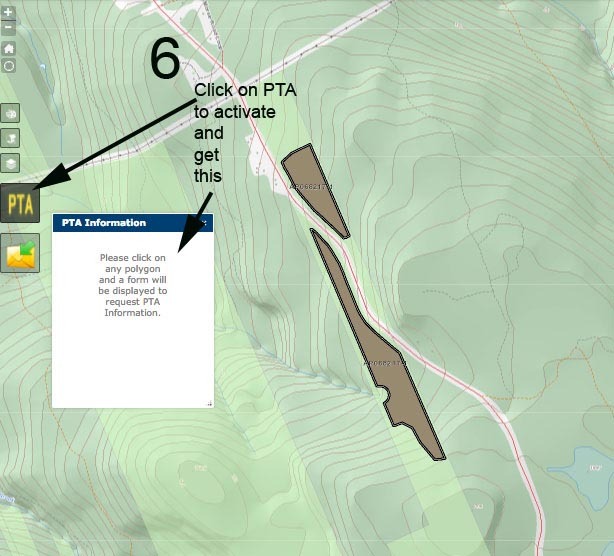 No sign-up is required to access the Harvest Plan Map Viewer. 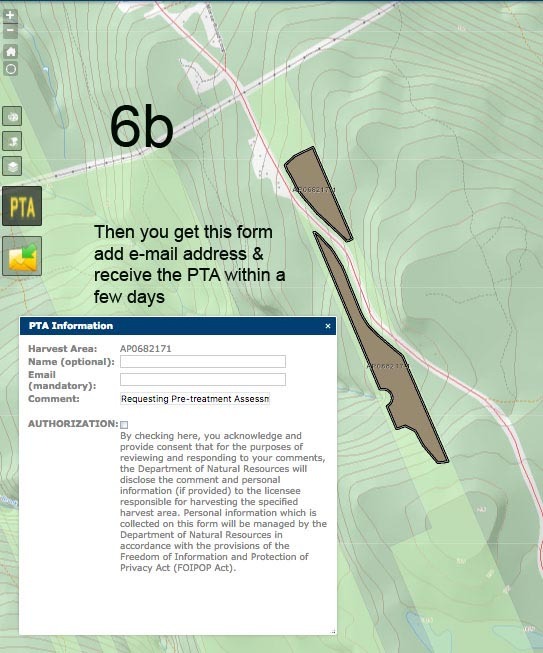 Previously, the lists (and the information available via the Harvest Plan Map Viewer) included only the “Harvest Type” with two types listed (clearcut & partial harvest) and one had to request the PTA (pre-treatment assessment) to find out what Prescription Type is being proposed. “Partial Harvests” as defined by NSDNR can include harvests conducted under both even-aged management (e.g. 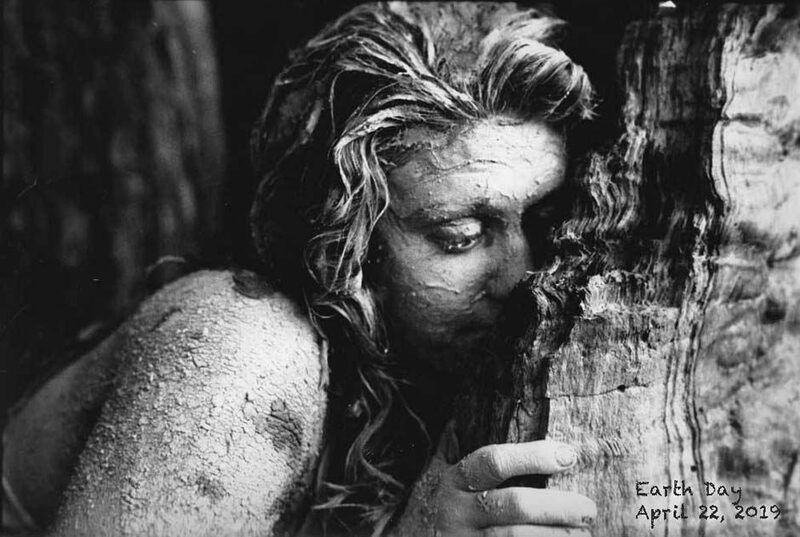 when the Prescription Type is for Uniform Shelterwood) and uneven-aged management (e.g. 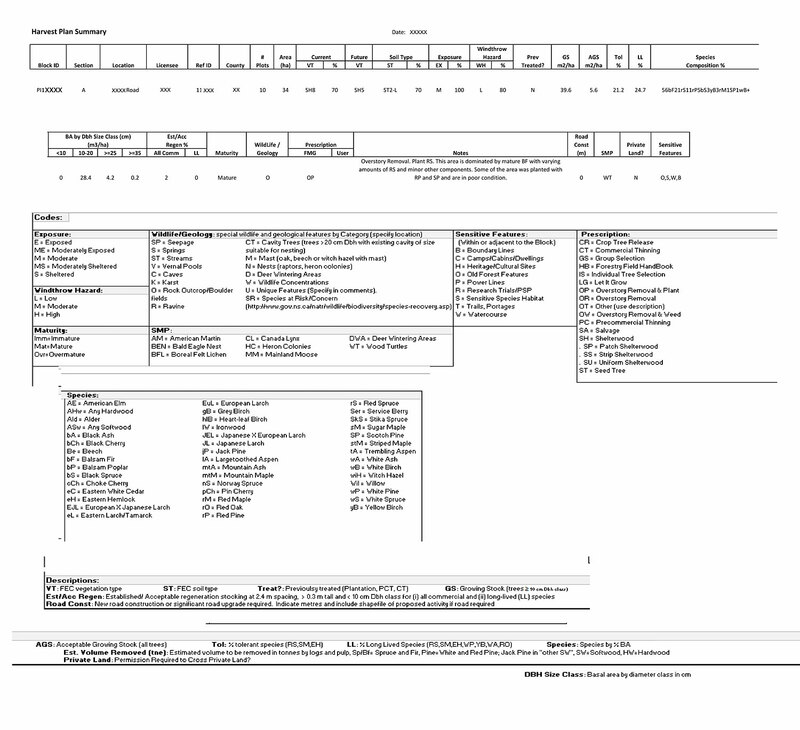 when the Prescription Type is for Individual Tree Selection). Thus the Prescription Types are important. Uneven-aged management is required to sustain multi-aged Acadian forest, while even-aged management in most cases converts or sustains forests as even-aged, early successional forests. Even-aged methods have been the predominant system in the wind dominated Acadian Forest of Nova Scotia but it has been recognized that uneven-aged management deserves a larger role. Most, perhaps all, harvests identified as uneven-aged management would likely “get a pass” from me, while I might want to further investigate particular clearcuts and partial cuts conducted as part of even-aged management regimes. So providing this level of information without having to request the PTA is helpful in my mind. 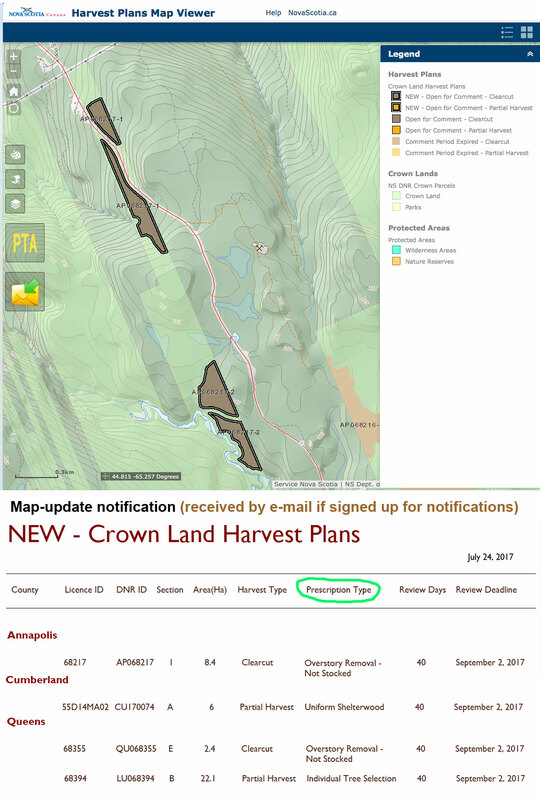 Inclusion of “Prescription Types” on the Update Lists helps to make the decisions around harvesting on Crown Lands more transparent. Hopefully NSDNR will post some videos on how to use the Harvest Plan Map Viewer. In the meantime, here is a brief guide for people not familiar with this interactive map (or similar interactive maps). 1. Go to Harvest Harvest Plan Map Viewer (or go first to the Cover Page, then select the link Visit the Harvest Plan Map Viewer). 3. 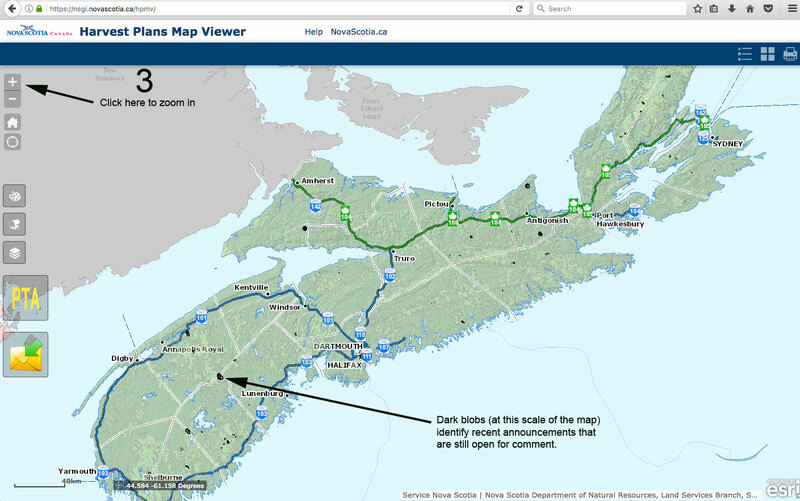 The most recently announced plans (which are still open for comment) have highlighted margins and stand out even with the map at a scale showing the whole province. Zoom in by clicking on the + icon (view Step 3 Example). 4. 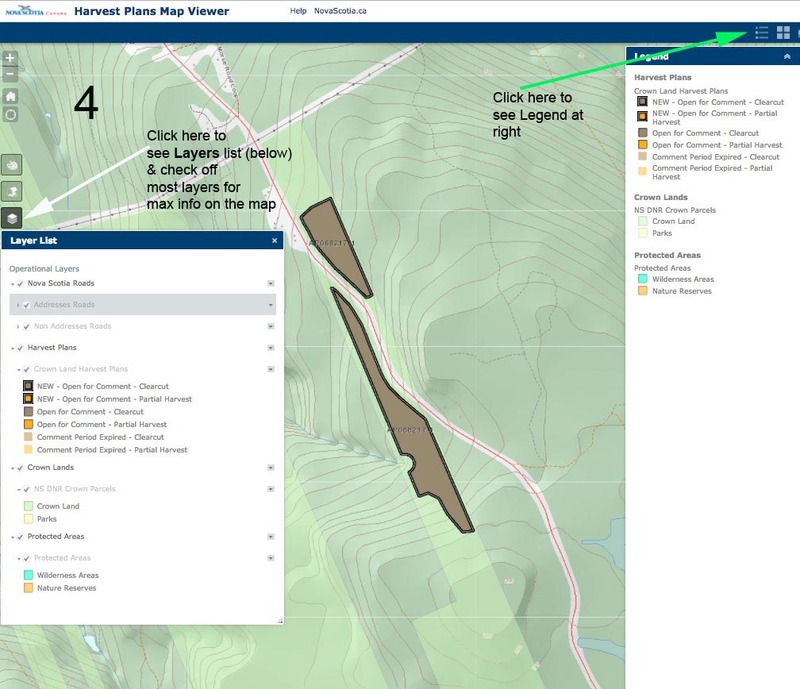 Click on the Layers Icon, and check off most layers to see roads, harvest plans, Crown lands and Protected areas (view Step 4 example). 5. 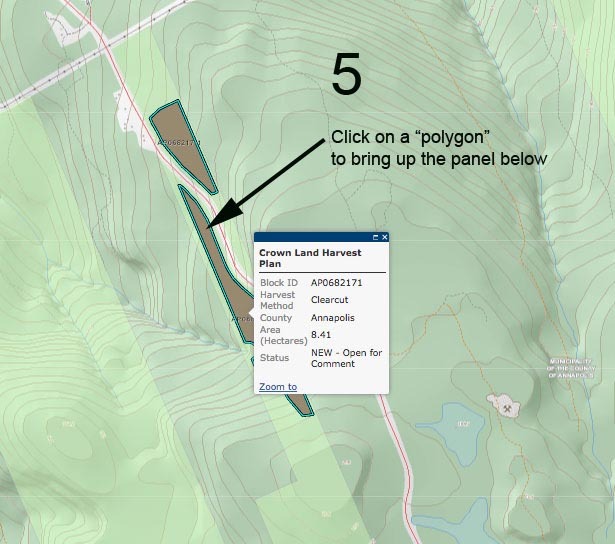 Click on a “polygon” to bring up info on Block ID, harvest Method (clearcut or Partial harvest), County, Area in hectares and Status- whether it’s still open-for-comment (view Step 5 Example). 7. Finally, if you request the PTA, you will receive the PTA info directly from the company proposing the harvests. View Example of PTA. Then you may want to submit comments. The HPMV has a tool available which allows for sending comments directly by clicking on the applicable harvest plan. I have not yet been able to figure out how to do this. I have requested help from NSDNR, and will update this page once I get it. An alternative is to submit the comments directly to NSDNR via the NSDNR media contact (Bruce Nunn 902-424-5239 E-mail: nunnbx@gov.ns.ca). Along the left hand side of the screen you’ll see an “envelope” icon (blue arrow). Click on this, then click on any polygon which is open for commenting and an dialogue box will automatically appear with the appropriate harvest plan you are attempting to comment on. If you still have trouble let me know, but also feel free to use the “Help” tab (red arrow) at the top of the screen which outlines how to use the map viewer. See screen shot below. It was and Thanks again Ryan/NSDNR! 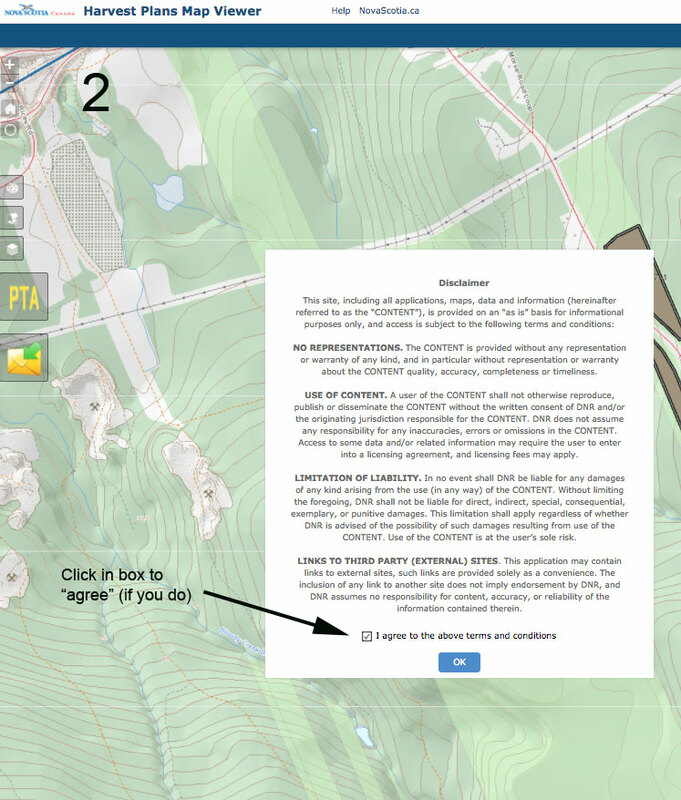 Your comment will automatically include the harvest area reference number indicated on the map. After the comment period closes, we will use a 3-point scale that will provide a measure of the relevance and impact of each comment. The Licensees may begin harvesting on any plan for which no comments have been received or which the department determines there is insufficient need to postpone the harvest. This entry was posted in Acadian Forest, clearcuts, Conservation, HPMV, NSDNR, Selection Harvest, Show Us the Science. Bookmark the permalink.